The hip hinge is a basic movement pattern that everyone must have. When people have atrophy of this movement pattern they end up compensating in all sorts of ways (trendenlenberg, dynamic valgus, knee dominant movements, lumbar flexion). This leads to decreased performance and increased risk for injury. If you want to truly load the hips then you have to know how to hip hinge. The hip hinge is a hip dominant movement that is the basis for most athletic movements. Sure, there needs to be a baseline level of strength at the hip joint. But you can’t really think clamshells and side steps are going bring your patients back to their highest activity level. 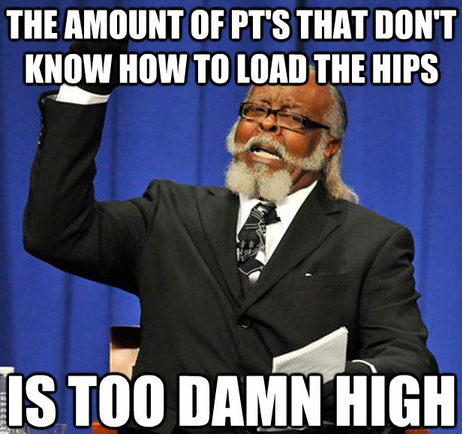 Even if your patient isn’t an athlete, they need to hip hinge. Everyone has to do it, and has been able to do it at least at one point of their life (it’s part of the developmental progression). Furthermore, it’s used for basic life movements. The hip hinge is how you should be picking objects off the ground, it’s how you should go from sit to stand, it’s how you should move furniture, it’s how you should do most activities throughout the day. 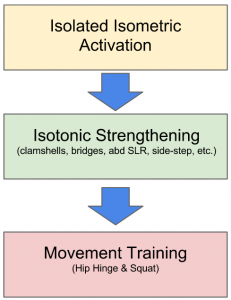 An oversimplification of a strengthening progression. Don’t underestimate the importance of movement training. Strength without movement training is worthless. 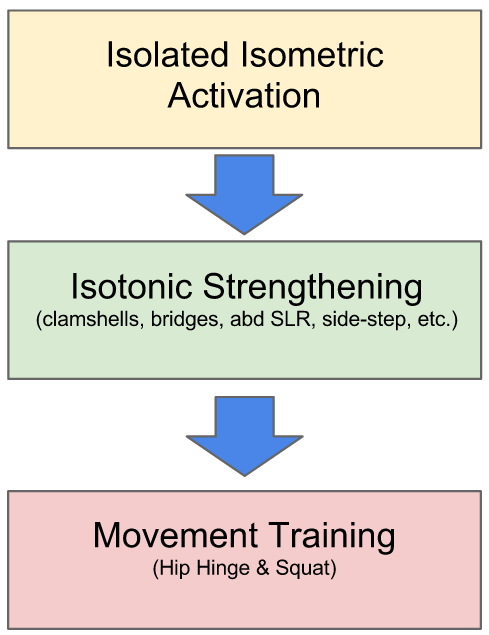 The basic progression for most strengthening exercises in rehab is to go from isolated isometrics to basic isotonics to dynamic movement patterns. Seems pretty simple, right? However, many PT’s miss this last part. This is where “bridging the gap” happens. If you have your patients doing clamshells with black thera-bands and sidelying hip abduction with 10 pounds and you haven’t started hip hinging, then you are probably wasting everyone’s time. By working on your patient’s hip hinge movement pattern you will not only be sparing their knees and backs, but you will be giving them a movement pattern that they can load up as much as they want for the rest of their lives. They can either keep it as a basic ADL movement (sit-stand, picking up objects) or they can load it up to deadlift hundreds of pounds, crush a golf ball 300 years, explode past that pesky defender, or blast a forehand down the line. Regardless of what you think your patients can do, it’s best to leave them the option to choose themselves. A hip hinge is a posterior weight shift through the hip joint. It’s a sagittal plane moment where the hips become the axis between the upper and lower extremity through a neutral spine. Hip hinge is the basis for most hip movements. 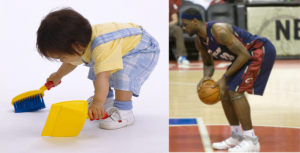 Developmentally we progress from the sagittal, to the frontal, to the transverse plane. Since the hip hinge is the most basic and dominant sagittal plane motion for the hips, it is the best place to start movement patterns. Before you start developing stability in the frontal and transverse plane, it is paramount to master the sagittal plane first. Loading up the hip and developing some serious strength and power is a great advantage of the hip hinge. But it also has many advantageous effects throughout the body. The deadlift is hip hinging at it’s best. So we will use it as an example in this comparison. The hip hinge, as it implies, is a hip dominated movement. 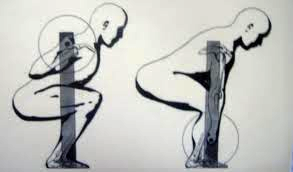 It is a much simpler movement than the squat. You really only use one part of your body (hips) to “push the ground away”. The main joint movement afferent input your brain has to deal with is in the hips, knees, and spinal angle. An oversimplification of the physical requirements include: posterior chain activation, posterior chain mobility, spinal stability, reactive scapula retraction. The squat is more of a knee dominated movement. However, it’s not that simple. It’s much more complicated movement than the hip hinge. It requires stability of all 3 planes and involves much more motion throughout the body. You are “pushing the ground away” using 3 body parts (ankle, knee, hip). The addition of 2 more joints to the motion makes the movement much more difficult to perform. This additional afferent information will require equal efferent information to adequattely control the joint motion. An oversimplification of the physical requirements include: anterior chain stabilization to maintain upright posture (core, hip flexors, anterior tibialis), significant ankle, knee, hip, & thoracic mobility, multi-segment eccentric control, and maximal triple-extension activation. I tend to use 4 movements to assess a patients ability to hip hinge: SFMA Multi-Segment Flexion, Quadruped Rocking, Hip Hinge with Dowel, and Squat. SFMA Multi-Segment Flexion: The sagittal plane should be the first movement you check in every patient. If they can’t master the sagittal plane, they’ll compensate in another plane. Don’t chase your tail trying to fix a rotational problem when it’s really a sagittal problem that compensates in the transverse plane. Now I’ll step off the soap box…MSF requires a posterior weight shift to touch toes. If you patient can’t touch their toes or doesn’t posterior weight shift, then hip hinging will serve them well. Quadruped Rocking: This isn’t just a childs pose test for lumbar flexion. You are checking their ability to sit back into their hips in an unloaded position. To perform, have them go into neutral spine and rock back as far as they can without losing their lumbar position. If you patient can’t maintain neutral spine (i.e. they go into flexion) while going into hip flexion then hip hinging is a good option. Hip-Hinge with Dowel: This exercise can give you a great view into their movement patterns and possible physical impairments. It’s best not to coach this and give alot of cues. Simply perform the movement yourself, then ask them to repeat it. Try to assess their movement pattern and associated compensations. Squat: The squat is complex and there can be many different impairments that prevent functional movement. 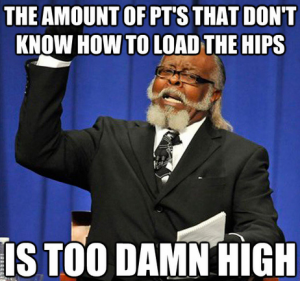 But if the patient cannot get their hips below parallel then the chances are they are so quad dominated that they can’t shut them off to sit into their hips. There is no clear cut protocol and way to teach the hip hinge. This is probably why there’s no research on the movement pattern. There are just way too many variables (in the patient, in the movement, in the exercises) to try to standardize in a study. But this is a good thing if you are willing to put in the time and effort. There are three main things you can control: the progression, the verbal cues, and the visual props. The most important aspect of the progression is that you want to make sure your patient has mastered the movement pattern before you load it. This is where most people go wrong. They load the up deadlift with too much weight or start patients with single-leg deadlifts when they don’t even have the pattern down. Determining where your patient should start may take some time. It’s always better to have the exercise be too easy and progress them rather than have it be too difficult and frustrate and/or hurt them. Just like the verbal cues, you don’t want to overload them and make them more focused on the props than the movement. The initial movement pattern assessment determines which props I use. Depending on each patient you will have to alter your props. The one I find most useful and most beneficial for beginners is placing a stool in front of their knee (see video below). This prevents any anterior translation of the tibia. The good thing about a stool vs. an object that doesn’t move is that when the patient gets feedback they will be forced to intrinsically stop the knee moving forward instead of an extrinsic stop where the patient just jams the tibia against a bench or wall. This is some basic troubleshooting to consider when people are having difficulty with this movement pattern. Remember, all of this stuff is not black and white. It’s a continuum. It’s usually not as clear and easy as categorizing patients into one pattern. Some people may have a blend of all of these. Hopefully this will at least give you a place to start. Here is a video example of faults #2 & #3. The hip hinge movement pattern is essential for anyone that moves. A loss of this movement pattern can lead to many deleterious effects. By training the movement pattern you will give your patients the ability to perform ADLs and athletics without compensations and increased risk for injury. Once your patient has the hip hinge down they can either simply maintain it for health and injury prevention, or use it to truly load the hips and build some athletic power. Isolated isometrics and basic isotonic strengthening exercises are necessary. But to take our profession to the next level (and your patients) we need to “bridge the gap”. Try adding some movement training into your plan of care. Your patients will appreciate it. Hopefully this article will give you an idea of how to integrate this into your practice. And with every exercise you prescribe, try it yourself (but don’t be this guy).